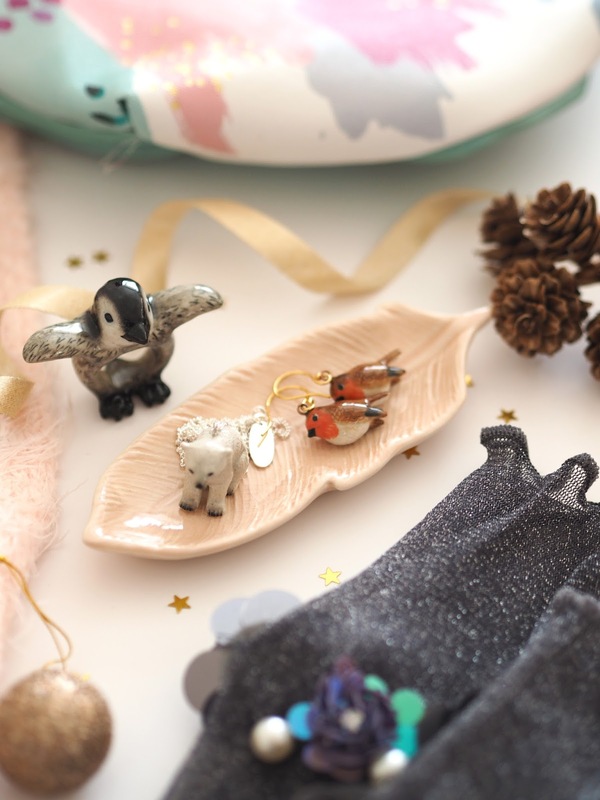 Today is my fourth and final Gift Guide of the season for you and I'm focusing on Stocking Fillers! Great little gifts to perhaps add to a 'main presents' you've already got somebody, a Secret Santa gift if you're on a budget or even for table favours if you like to do that for your guests on Christmas Day - I think I've got you covered! Check out my previous Gift Guides here Luxury Gift Guide, Pink Gift Guide & Scented Gift Guide. For the Cat Lover | This adorable little Yumi Cat Charm Necklace is perfect for a cat lover like myself. It's long length and I particularly love the added beading & tassels alongside the main cat charm. This Yumi Fluffy Cat Scarf is the cutest thing ever!! It feels super soft and snuggly in the most purr-fect pastel pink shade. It's little grey face is at one end and feet and tail at the other this the loveliest gift for any cat lover! This scarf also comes in black and you can find plenty more animal scarves on their website too. Use my code: KATIE10 to get 10% off everything on Yumi! I bought this little Cat Dish from Oliver Bonas a while ago but I've just checked and it's still available online! It makes such a pretty addition to a bedroom where you can store trinkets or just leave it out on display as it is. The Little Candle Co create the most beautiful, elegant homemade candles using soy wax and a wide variety of fragrances. They're reasonably priced so would make the perfect stocking filler. The festive scents I chose are Winter Wonderland and Snow Fairy - Inspired by Lush's Snow Fairy Shower Gel and yes, it really does smell just like it! Winter Wonderland is lovely too, described as "a rich, warm, festive fragrance with mulled wine soft fruits and hot spice enlivened by precious woods and glowing embers." 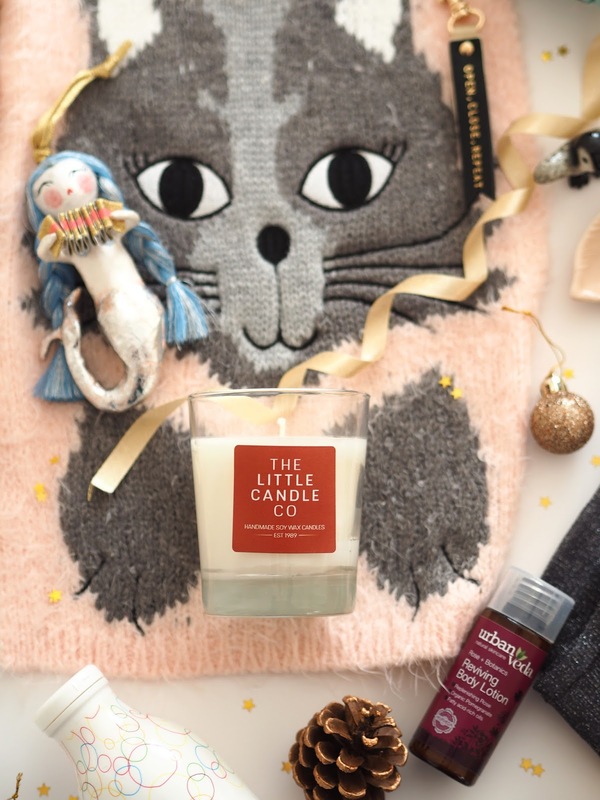 If you head over to my Scented Gift Guide you could WIN a Small Jar Winter Wonderland Candle plus 2 Golden Glitter Tea lights in my GIVEAWAY at the bottom of my post! And Mary is one of my absolute favourite brands of Jewellery as you may already know if you read my blog regularly! They create the most beautiful, intricately made porcelain pieces and their designs are mainly animals. They are all ridiculously cute! I thought I would showcase three of my favourite 'Winter themed' pieces so we have a Penguin Ring, Polar Bear Necklace and Robin Earrings. Don't they look adorable together? I highly recommend visiting there website although I warn you will not be able to leave it without buying something! Tis the season for snuggling up with a mug of hot chocolate so why not make it extra special with some different flavours? 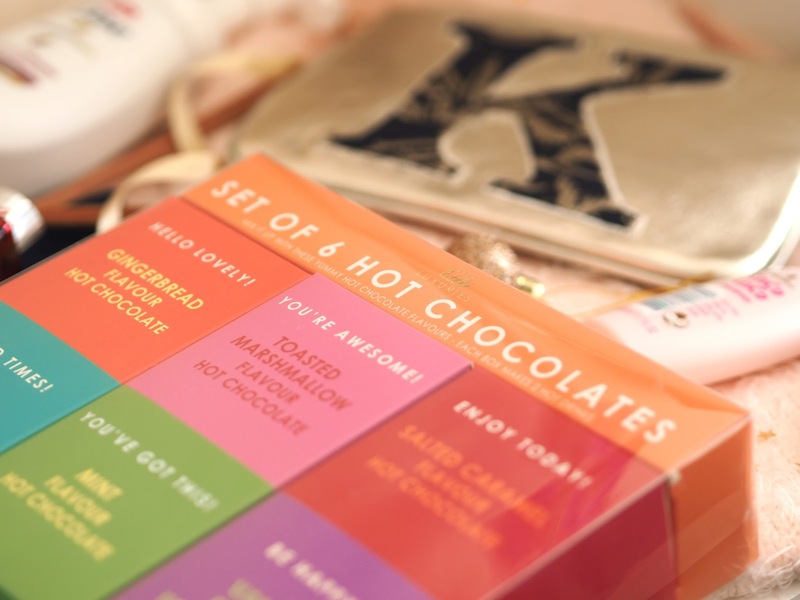 This Hot Chocolate Gift Set from Next comes brightly packaged with 6 different flavours inside including gingerbread, toasted marshmallow, salted caramel, classic chocolate, mint and vanilla! I've already tried some and can confirm they are delicious! Perhaps wrap them up with a lovely little personalised mug? Socks are always a lovely stocking filler at Christmas time and these Gingerbread Socks by Oasis are just the cutest! I really love having reed diffusers in the house, they're a great flame-free and fuss-free way of fragrance gift your home and hence why I believe they make an ideal gift. This Festive Spice Reed Diffuser Set from Next is scented with Red Berries, Oranges, Clove, Cinnamon & Patchouli "The perfect, cosy Christmas; the crackling of an open log fire, fruity scents of fresh mulled wine bubbling away on the stove, and the twinkling of decorations in the candlelight. This is guaranteed to make you feel festive." They look really elegant out on display and each has a little reindeer charm hanging from them which I think is a cute touch. I said in my previous Gift Guide how excited I was that So...? Perfumes have made a big rival this year as it takes me right back to my early teens! Their packaging is fun and colourful and any of their scents would make a perfect little stocking filler. Candy Floss - So…? Candy Floss body mist captures the essence of fun fairs and sweets, with each fragrance spritz filling your heart with fluffy joy! Sweet Pea - A floral sensation with a romantic twist, So…? Sweet Pea body mist is the perfect fragrance for evening and date nights. 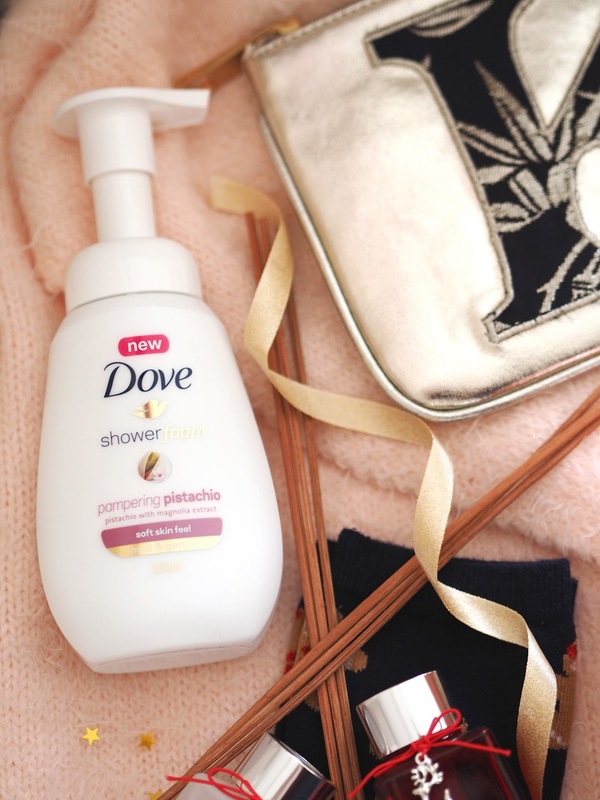 Dove have just released these brand new Shower Foams and I am absolutely loving them right now! They're light and airy whilst still very nourishing. It's not often that you find pistachio scented body products and this Pampering Pistachio option is just divine. Another lovely little set of stocking fillers would be these Lee Stafford Hair Products. You've got a mini shampoo and conditioner here which for me would be going straight into my travel bag as they're such a perfect size. 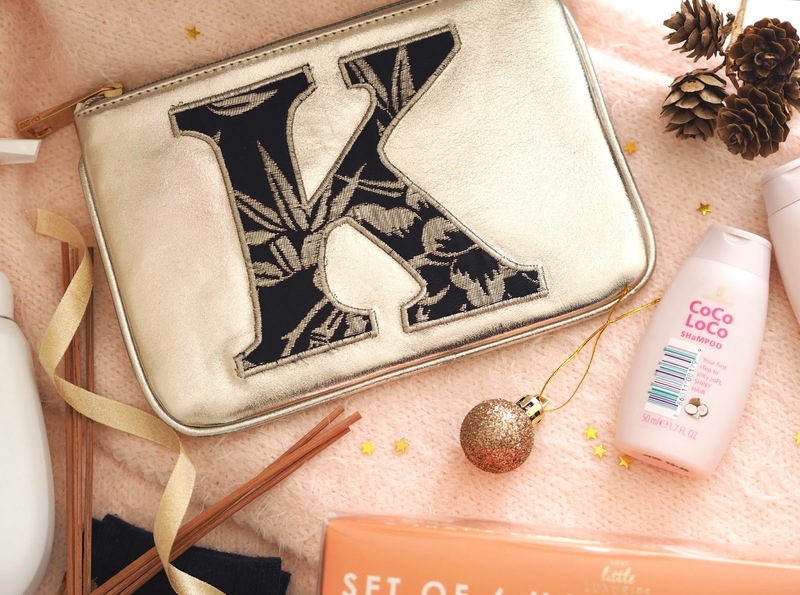 Getting a personalised gift always feels really special and you can pick up these Initial Make Up Pouches from Oasis in their gifting range right now. 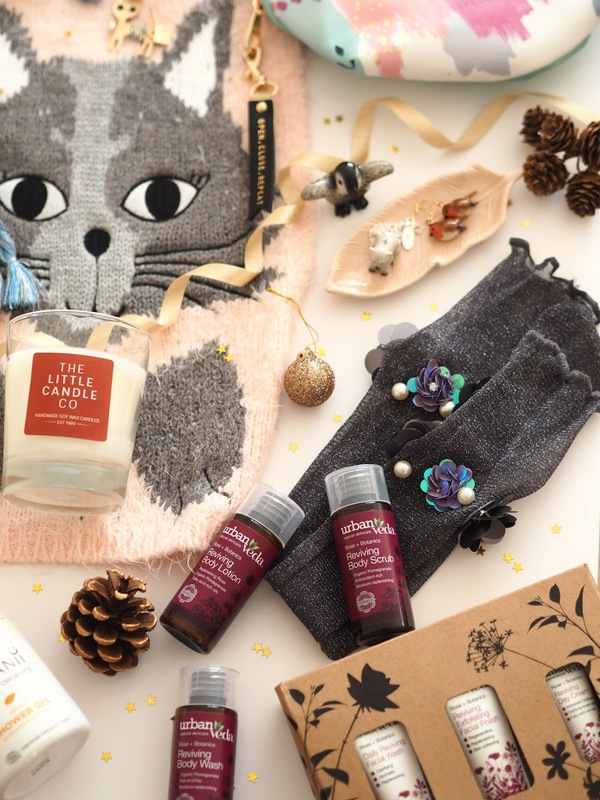 This year Urban Veda have brought out some wonderful gifts sets to let you discover their range and beautiful products and/or stock up on your favourites in travel size! I particularly love this Reviving Skincare Gift Set which includes both face and body products with the most stunning rose scent and botanical extracts. Designed to "refresh your senses and nourishes the skin with every use. Intensely revitalising skin, hydrating rose damask combines with antioxidant-rich pomegranate and essential fatty acid-rich borage to recharge and replenish dry, tired and mature skin. Supporting elasticity, skin is left feeling soft, clean and cared for." You will receive a Reviving Facial Wash, Exfoliating Facial Polish, Day Cream, Body Wash, Body Scrub and Body Lotion inside a lovely gift box. I think Tree Ornaments make such a lovely gift for a stocking filler, secret santa or table favour. Not only are they a keepsake that can be brought out year after year but you can really tailor them to the recipients personality! 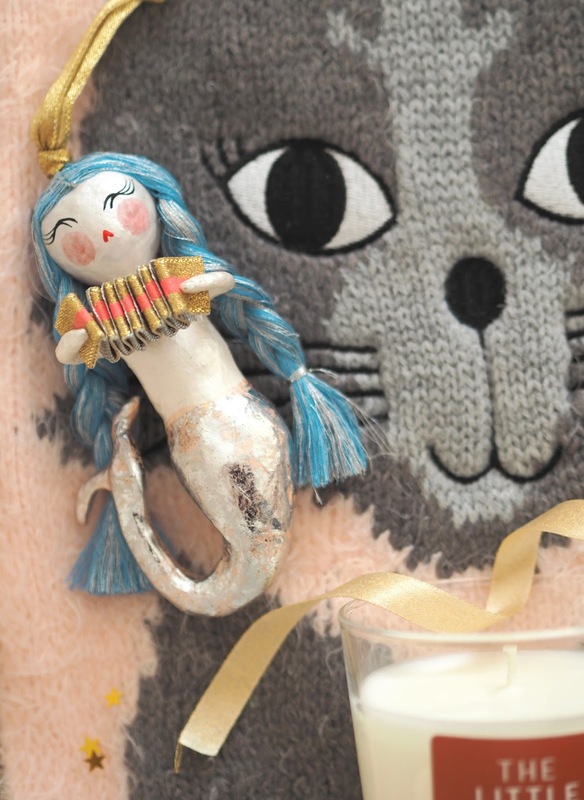 When I saw this Mermaid one on Anthropologie I pounced on it straight away, it's so beautiful. I am absolutely loving these Organii Shower Gels at the moment. The packaging is fabulous and I'm really enjoying the scents, I've tried both Argan & Shea Butter. They're organic so would be a lovely product to introduce people to by gifting one this Christmas. 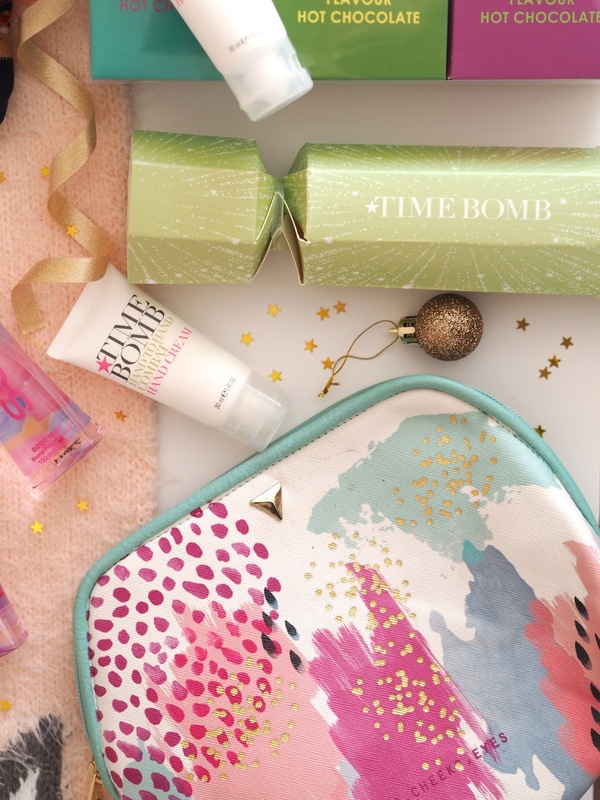 This Lulu Time Bomb Cracker would look really cute on your Christmas table! 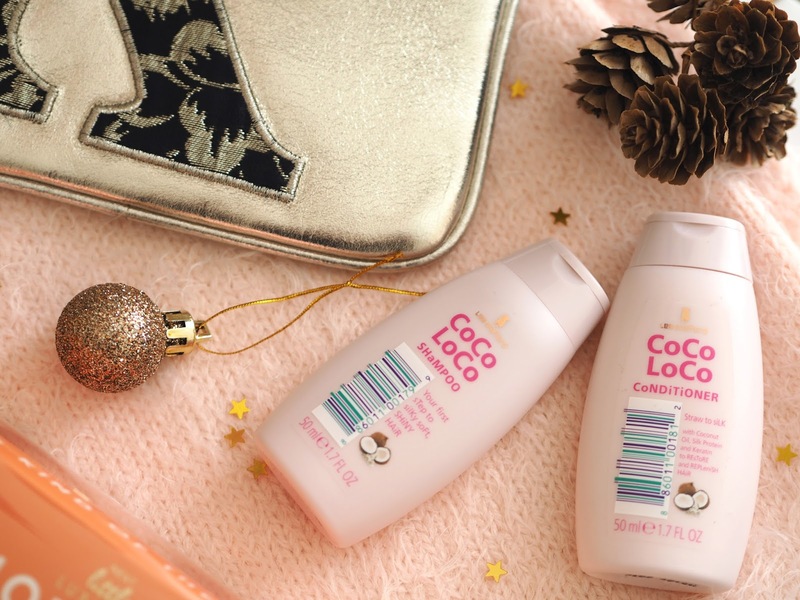 Once opened you'll find two of Lulu's top selling Hand to Hand Combat Hand Creams which are rich in vitamin E, pea extract & argan oil and perfect for keeping in your handbag when on the go. How pretty is this Paint Print Make Up bag?! It's new in from Bluebelle & Co from one of my favourite brands called House of Disaster. Perhaps wrap it up with a few make up items for an extra special gift, see my Luxury & Pink Gift Guides for more inspo! Check out the Bluebelle & Co website for a load of fabulous gift ideas plus you can visit their store in Brighton. 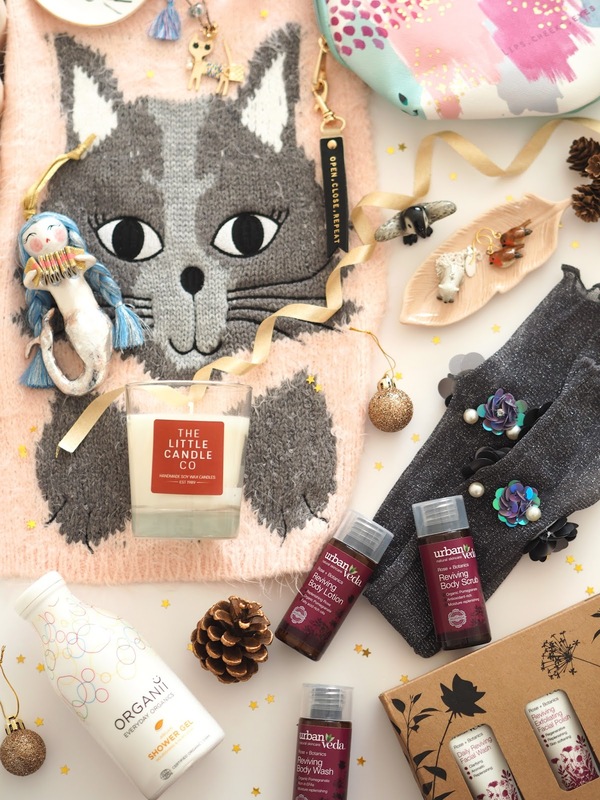 What is your favourite piece from my gift guide? Let me know if it has given you some gifting inspo! I haven’t tried any of these products yet! Great photography! The cat scarf is too cute! I love the So..? fragrances too, they're my favourite and so affordable!